Purses and totes are an absolute necessity for ladies! Am I right girls?! It can be so hard to find something that you just love or that fits your personality! But with these gorgeous bucket totes, you will not need to look any further! This beautiful USA handcrafted (decorated & then sewn) bucket tote is the perfect thing to carry all of your personal items. It comes in two sizes of Regular (12" x 10" x 5") and Large (15" x 11.5" x 6"). The regular is great for an everyday purse, while the large is perfect for when you need to take a few extra items like a laptop or books. The body of this tote bag is made of a beautiful canvas material that has a slight sheen, while the bag is trimmed with geniune leather. The handles, the trim around the top, the bottom of the bag, the zipper enclosure and the zipper trim are all genuine black leather. The interior is solid black and there are two slip pockets, one zipper pocket and a sewn in key fob. The leather bottom has four metal feet to stand on. You can decorate just the front and leave the back black; or you can decorate both front and the back. You have idential, coordinated or completely different designs on the front and the back. The choice is yours!. Personalize your new tote with a beautiful pattern of your choosing. Add a monogram, quote, or graphic as well! Have fun creating the perfect tote bag for yourself. And if you need any help creating your dream, we are here for you! Be sure to look at our bucket bags and classic totes in our Handbags and Purses section as well to make sure you are purchasing the perfect bag for you! Take a look in our Accessories section where you will find ladies wallets, leatherette keychain ID holders, vinyl checkbook covers, and more! I got this bag a couple days back and simply love carrying it. It is the perfect size for me. I love the fact that it has a zippered section inside AND the attached key fob because I no longer have to dig for my keys. I also love the zipper on top. 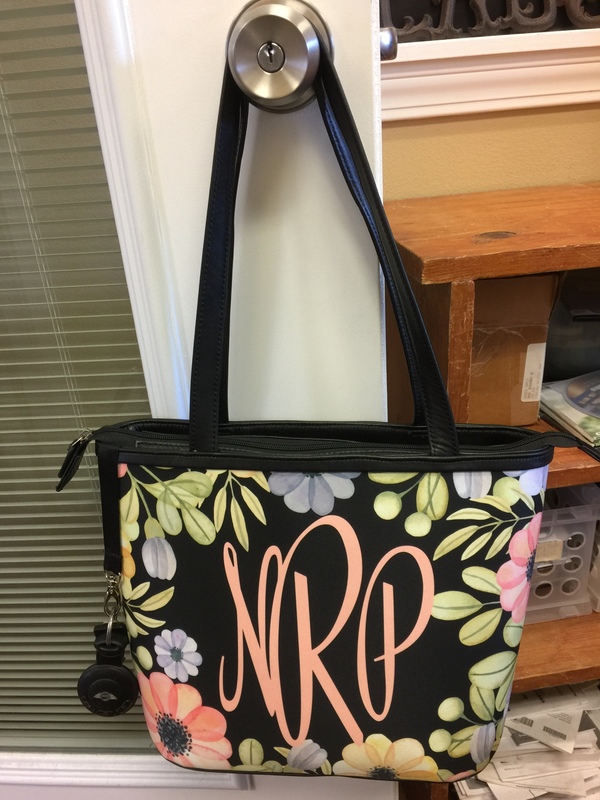 It gives the perfect combination of tote that I can leave open for quick access to my things, but zippered up in the car when I am driving so my stuff doesn't end up on the ground.